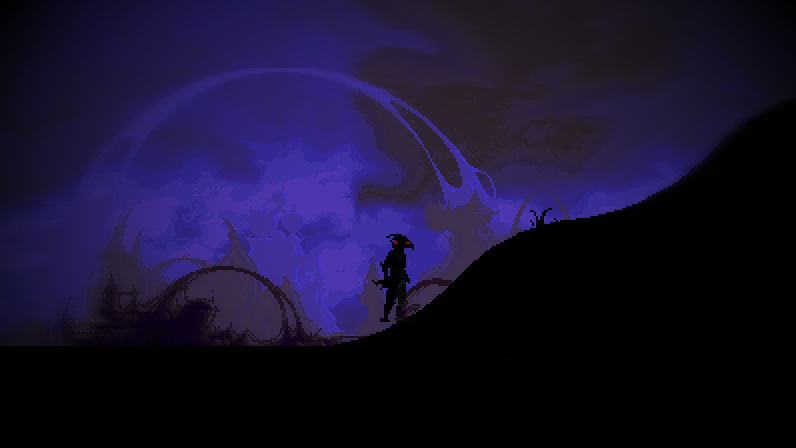 A project VERY inspired by Shadow of the Beast trilogy by Psygnosis and Limbo by PlayDead. Blends animations together with premade 'tween' animations and allows for extras like reacting to falling, and changing the animation frame depending on speed. No auto-generated animations. Edited by Lewis X, 17 November 2015 - 01:48 PM. Well.. The graphics including the background is fabulous... Waiting for it to complete..
Edited by Lucky Duck, 13 September 2014 - 01:07 PM. A lot of the BG is to change actually as it way to closely copies SOTB 2, so placeholder city atm, but it will not change stylistically at all. I don't think so.. At first, they seemed to be your own and they are unless you used the original BGs of SOTB 2. The closest layer of mountains I drew myself. I need to do the same with the rest. Edited by Lewis Cross, 13 September 2014 - 01:13 PM. Ok best of luck! While some stars could make it better. Might be the frame rate of the video but does the character properly turn when changing run direction? I couldn't see. He certainly does later on when standing and changing direction. Which is nice. It's something I do with my projects. Always adding at least one frame where the character is seen to actually turn (if one frame then have them face forward or backward and if allowed more frames then obviously filling in the gaps). It's such a minor addition and yet adds so much depth and sense of three-dimensional form to a two-dimensional object and makes simply flipping direction look cheap and flat. Anyways it's looking good so far. 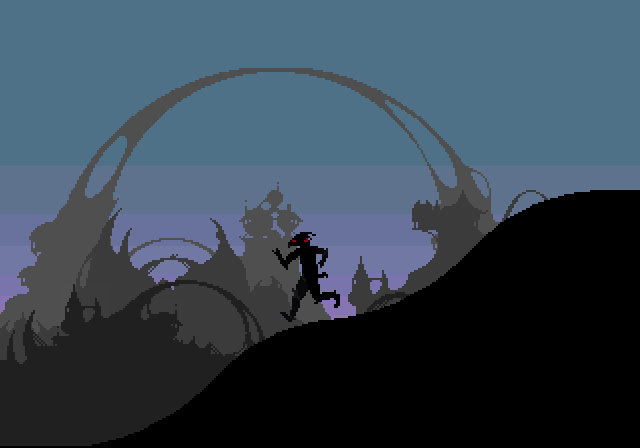 Not keen on the Limbo stuff myself (I thought that game was terrible) but I loved the style, music and otherworldly atmosphere of the Shadow of the Beast games, and just wish they could have had some better level design and a bit more gameplay depth and improved feel to the combat. Edited by Carnivac, 13 September 2014 - 01:31 PM. Hey, how did you do your ground collisions to follow the slopes so nicely? Moves pixel by pixel checking for changes in pixel height. Nothing fancy. Wow that a really cool animation system you have. Quick question are all the animations done with pieces or just the transitions animations? Pieces, I could of used tweens but I hate the look. 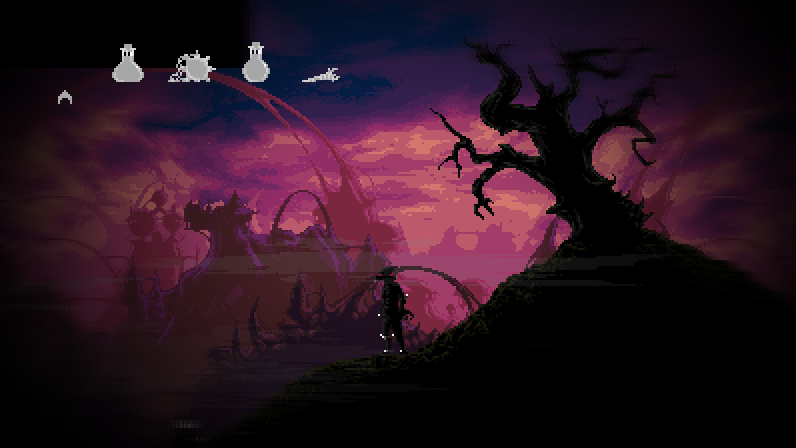 Cool idea to mix two so different games as SOTB and Limbo, BTW. Do you start out as a human that then gradually gets changed to a beast? That character looks humanoid, but certainly not human, so I'd guess that. (If you do this, you could also have the eyes start out as white, then only get red after you transform, for a subtle "you're more beastly now!" effect). The video looks really colorful, are you aiming for Limbo's really 'cold' outlook or something more cheerful? 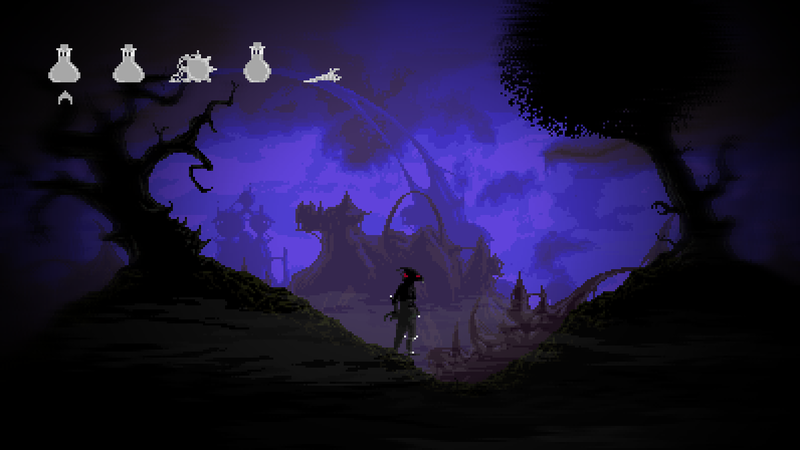 SOTB was a pretty careless brawling game while Limbo just makes you depressed. Would be interesting to know where you're taking the most from. I havent quite figured the story, but in the spirit of SOTB, you will be trying to become a human again. The colour element is to give the game more of a sense of 'hope' than the original games did. Something to strive for, in the story. Edited by Lewis Cross, 14 September 2014 - 03:41 PM. So where do i download this demo? Oh shoot just realsied one of those is required, I'll put one up today. Even the Moderator missed it, lol. Yeah, Yal. Do your job!!!! OK, since 12 hours has passed and still no demo, I'll close this. (I reached it from the "recent topics" menu so I didn't realize this was WIP instead of GI&D, otherwise I'd closed it). Edit your post and add a link then report the topic and say "demo added" and we'll reopen it. First thing I did was grab my gamepad, but no support for it yet. Also, full screen mode is a bit broken, as it just renders to the top left of screen. I cant jump THEN move left/right!? arrrggggg! looks good-ish tho! I like it. Nice bit of realism. I say that as someone's gotten a bit fed up with the magical jumping powers every platform hero seems to have. Thinking of doing the same with one of my games though having the left & right able to adjust the length of the jump in mid-jump. Certainly not keen on changing direction. It's glitchy though cos if you try to turn back in mid-jump then press to go the way you're already going when he lands he has a fit constantly turning left/right til you let go of the key. I'm not keen on the blur around the edges myself. Sort of thing that keeps making me rub my eyes. I know it's likely part of this dream-like surrealness but I would be happy with an option to disable it. But that's just my opinion. Edited by Carnivac, 16 September 2014 - 07:50 AM. Ha! Carnivac has it down to a T. It's intentional. I intend on adding variable jumpheight though. Yeahh, there is a good way of doing it, I need to nail it but It's all WIP/placeholders. I understand the intention to it, to prevent jumping then pressing a direction and I agree with that. But, it is when you are standing next to an object holding the button to go towards it and then pressing jump (and only jumping up) which is the awkward bit. In that case the player clearly wants to jump on the object but then has to turn around and make a run up. Just feels not right to me. 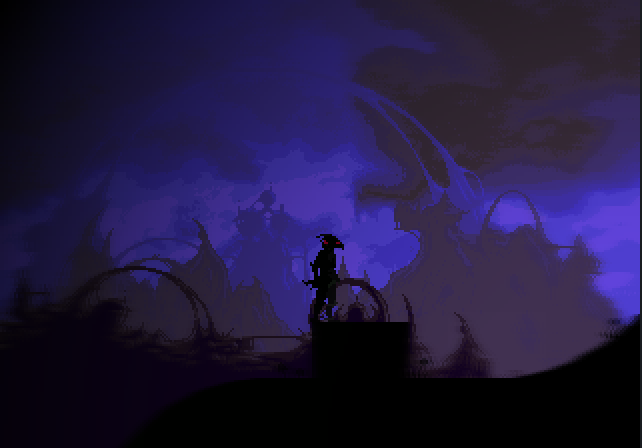 Is this definitely a Shadow of the Beast fangame then? Very much, but no, it's only EXTREMELY simmilar. All art etc will be new and stuff. The titlescreen is all custom. 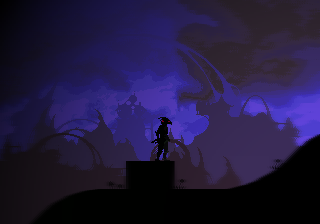 Still very much a fangame even if everything is created from scratch. Just hope Sony either doesn't see it or is just ok with it as they own all the Psygnosis IPs and have a new Shadow of the Beast in development for PS4 last I checked. I do like that title screen. That game seems to have died, nothing more has been mentioned about it? Kinda hope it hasn't but it is COMPLETELY different. 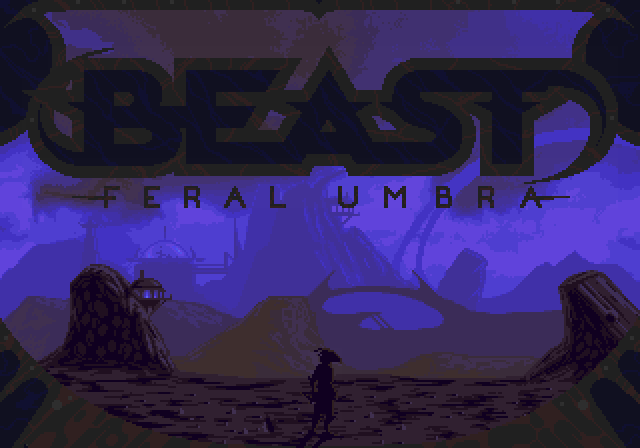 But you probably want to type out "Feral Umbra" everywhere you showcase your game just in case. Just tried out the demo and now, I'm willing to play it again and again. Working on the full asthetics. Mountains will have shading at some point. You make some good points Yal. Hopefully the overkill of black makes it unique enough! The new palette is already a huge improvement over the previous screenies! I'd say it's pretty damn hard to get the two games mixed up now. Edited by Lewis Cross, 17 September 2014 - 03:53 PM. Now it's looking really pretty. It's so darn subtle, yet does so much! Each one is just two colors, right? Edited by Lewis Cross, 17 September 2014 - 03:57 PM. I want to make it clear I wont be selling this game. That would be bad of me as it is farrrr too simmilar. It will however, be on GameJolt at some point or another. Ah, I thought those extra colors were artefacts from the blur shader Whatever, it looks pretty AND low-fi at the same time. I like it. Is that red thing in the neck of the character a third eye? Nahh, that part of him just glows, as do his eyes. I might include some high-res art of him if I need it. Widescreen, y'all can handle that. Widescreen!! Fantastic! I am just . Edited by Lucky Duck, 18 September 2014 - 12:27 PM. Quite pretty. Looks a bit odd how the character's left foot is in mid-air, though. Yea. Not much I can do! looks more natural in play tbh. Yea. Not much I can do! But yeah, only do that if you feel you need to.